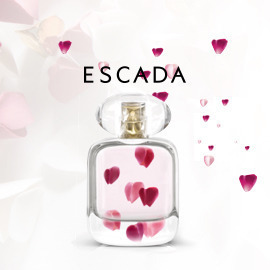 Name the new ESCADA perfume! What is happiness? How does one achieve it? Many think it’s about accumulating things & reaching milestones, but ESCADA believes happiness comes from positive choices, the richness of new discoveries & unexpected experiences. In short, ESCADA believes that happiness lies within each one of us, and it’s up to each woman to seize it, live it, and appreciate it. Happiness is the ultimate reward. Women in their early 30s, more than women in their 20s, understand they are in the driving seat to their own good fortune and happiness. They are full of complexity, contradictions and richness, and yearn to thrive through it all. It’s a time when women lead a socially rich life, despite peak levels of stress from work & family. They are seductive and confident, yet they feel age creeping in. They have adult-sized responsibilities, but still crave adventures, fun, and me-time. Surprise us with a name that has the potential to become a motto for women to create their own happiness.